Based on the idea that a specific range should be elaborated, the FC PM three-phase synchronous motors range with high torque for axis in direct drive without gear was born in the beginning of the 90s. This project, supported by the National Agency for Enhancement of Research, led ALXION to develop a range of 7 permanent magnets brushless motors, specially designed for direct drive applications in various industrial environments as glass and tyre industry, printing machines, textile machines. The motors exist in 230 Vac and 400V / 460 Vac windings. 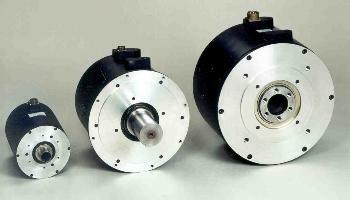 Currently, for new applications they are replaced advantageously by the up-to-date range of ST Motors. The Brushless Motors ALXION FC range was specially designed for direct drive applications on axis without reducers. The series include 7 main models performing continuous torque ranging from 14.3 Nm to 460 Nm, and peak torque ranging from 42.6 Nm to 1745 Nm. Thanks to the optimization of electromagnetical, mechanical and thermal characteristics, the continuous torque-to-weight ratio reaches up to 2.3 Nm/kg and the peak torque-to-weight ratio is up to 8.3 Nm/kg. Due to the high thermal inertia, the peak torque is available during a time only limited by the overload capability of the drive, i.e. from 2 to 5 sec as standard. The torque/speed characteristics allow to reach the peak torque without fading with a speed equal to or greater than 2 RPS. The peak power can therefore reach up to 20 kW.